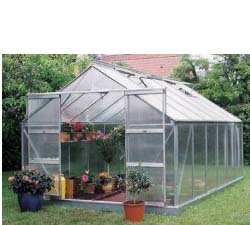 The Juliana Premium greenhouse is billed as a top-of-the-line, high-strength, high-quality hobby greenhouse. In this respect it did not disappoint. The Premium is a strong and well-built greenhouse with its heavy duty aluminum frame and 6mm polycarbonate panels. If you live in a location that gets extreme winter weather with very strong winds and multiple feet of snow, this would be a good consideration. The panels are very insulating and if you continue to garden throughout the winter, every millimeter of polycarbonate thickness helps. A couple of the nicer features the Premium offers that many competitors do not is the enclosed rain gutter and downspout system, and the hinged, lockable Dutch door. The rain gutter system is great at keeping the rain from pouring off the sides or front. The Dutch doors gives the Premium a high-end, European style feel, along with the frame shape, that adds to the attractiveness and functionality of the greenhouse. The Premium comes in a few size options (9'x9', 9'x12') which is nice, but we would have liked to see it in a few more available sizes. Another issue is the delivery method. The Juliana Premium arrives via freight unlike the Rion which comes in smaller packages. Consumers have suggested the installation is slight difficult due to confusing instructions but once deciphered you'll find the actually construction isn't as hard as they make seen. Conclusion: The Juliana Premium series is a very nice greenhouse, especially for those gardeners who live in areas with very harsh winters, or who like the look of a European-style greenhouse versus the barn style of the Rion Hobby Gardener or Prestige. It is attractive, has nice standard features, is extremely well insulated and durable. Also, be aware that the Juliana Premiums are approximately double the cost of the Rion Hobby Gardeners (our #1 pick) per square foot. >> Juliana Premium Product Specs!